sub-committee to look after the abattoir’s construction work, and a special meeting of the House to discuss the removal of the Municipal Commissioner and these decisions have been taken following a unanimous demand of the Municipal Councillors across party lines. Gurgaon police today said they have shot dead two persons after rescuing an 11-year-old boy who was allegedly kidnapped by the duo from here last week. Hundred of Sikhs, including victims of the 1984 anti-Sikh riots, took to the streets here to demand action against those named in the Nanavati Commission report that was tabled in Parliament today. Remembering one of the worst riots in the post-independent India, they raised slogans and burnt effigies of Congress leaders named by former judge G.T. Nanavati in his report. Justice Manmohan Sareen and Justice Manju Goel of Delhi High Court today said they would visit Tihar Jail on August 31 to make an on-the-spot study of arrangements initiated by the authorities to curb corruption in the largest prison in the country. Delhi Pradesh Congress Committee chief Ram Babu Sharma today indicated that the power tariff hike in the Capital may be reconsidered and a reduction may be in the offing. “‘Having received representations from various quarters, I have met Chief Minister Sheila Dikshit a number of times to bring to her notice public resentment against power tariff and metering woes,” he told reporters. DPCC President Ram Babu Sharma. A Delhi court today remanded to 14 days judicial custody the alleged mastermind in the sensational Delhi College of Engineering Entrance Exam scandal, Pankaj Dahiya, and his accomplice after the CBI informed they had completed their interrogation. Will official involved in ‘Patwari scam’ get away? The recent judgement of the Punjab and Haryana High Court to quash the appointment of about 2,300 Patwaris of the state has not only highlighted the glaring irregularities and corruption in the selection process, but also highlights the fact that officials responsible for such selections often get away with their deeds. With the arrest of seven persons including two constables of Uttar Pradesh police who were posted as PSOs to the Member of Parliament from Muzaffar Nagar district, the east district police today claimed to have foiled a dacoity bid in Kalyanpuri area. The realtors and land mafia in this part of the country can stoop to any limit to get a residential plot — even by including the dead in the race for a plot or declaring a living person dead. An undertrial today escaped from the Tis Hazari court complex while being taken back to the lock-up after his court appearance. Accused Rajiv ran away from the court premises after one of his accomplices, standing close by, threw chilli powder in the eyes of the policemen escorting him at about 1130 am, said a senior police official. Over 1.42 lakh kids were administrated pulse polio drops on the first day of the polio campaign in Gautam Budh Nagar district today, which is about 45 per cent of the target of 3.37 lakh fixed for the district. This included 44,026 children in Noida town, 24,087 in Dadri, 26,416 in Bisarakh, 17,344 in Dankaur and 19,484 kids in Javer. With the arrest of three persons, the Crime Branch of Delhi Police today claimed to have busted a cricket-betting racket operating in Rohini area. The sleuths recovered colour televisions, mobile phones, dairies and other items used for betting from the raided premises. To bring about improvement in the health care systems of the Armed Forces Medical Services Cadre, a brainstorming session involving more than 350 doctors is being organised in the Capital. The Delhi Cabinet today gave its approval to the proposal to increase the rates of land acquisition in the capital by 12 to 13 per cent. Briefing reporters, Delhi Urban Development Minister Dr A K Walia said that the rate for acquisition of agricultural land has been hiked from Rs 22.83 lakh per acre to Rs 24.94 lakh per acre. Delhi Mayor Mr Satbir Singh today took three significant decisions in the meeting of the House: CBI inquiry into the allegation of crores of rupees scam in the under-construction Ghazipur abattoir, setting up of a sub-committee to look after the abattoir’s construction work, and a special meeting of the House to discuss the removal of the Municipal Commissioner and these decisions have been taken following a unanimous demand of the Municipal Councillors across party lines. They alleged that a scam worth crores of rupees in the construction of slaughter house came to light thanks to a senior officer posted as Additional Commissioner had gone on leave after an argument with the Municipal Commissioner, Mr. Rakesh Mehta. Mr. Vijender Gupta, BJP Councillor, tabled a proposal for the change of Municipal Commissioner under section 54(3) of the DMC Act. He demanded that a special meeting of the house should be called to discuss this issue. He said in all the proposals tabled before the Standing Committee the, construction cost of the slaughter house was shown only Rs 65 crore. The contract was given to a German-based company. Later some additional works have been included in the premises of the abattoir without informing the Standing Committee and House members of the corporation. The construction cost of the slaughter house has increased up to Rs 110 crore due to the additional work. The tender for the additional work had not been invited. Secondly, they alleged, the in-charge of the slaughter house Dr. M. L. Sharma is facing a departmental inquiry. It has been tradition of the corporation that a ‘tainted’ officer is not given a sensitive posting which has been reportedly ignored by the Municipal Commissioner in case of M. L. Sharma. The Director, Veterinary, Mr Rajvanshi had resigned seven months before he was due to retire because of Municipal Commissioner’s ‘misbehavior’, Mr Gupta alleged. Mr Subhash Arya, Leader of Opposition, said that Municipal Commissioner had appointed a consultant to discuss all the matters in connection with the abattoir. The consultant is reportedly on the pay roll of a private company, which is unethical. However, the Municipal Commissioner said that he would find out the factual situation. Besides opposition members, Congress Councillors like Jitender Kochar who is Leader of House also demanded a CBI inquiry into the allegations to get rid of corruption from the corporation. Supporting the demand of CBI inquiry and change of Municipal Commissioner, Farhad Suri alleged that machines installed in the slaughter house were not purchased through tender. The former Mayor, Mr A. R. Verma had asked for item-wise details of expenditure in the slaughter house but the Commissioner failed to provide this. He alleged that Mr Mehta’s attitude was like a ‘dictator’. Councillor Sanjay Puri demanded that the Municipal Commissioner should go on long leave before the commencement of the CBI inquiry so that it could me made transparent. Gurgaon police today said they have shot dead two persons after rescuing an 11-year-old boy who was allegedly kidnapped by the duo from here last week. Senior Superintendent of Police, Mr Hanif Qureshi informed mediapersons that Shubham Arya, a sixth standard student of Summer Fields Public School was kidnapped from near his house no 1360 at Sector 15, Part 2, at about 1:15 pm on August 4 when he was returning back home from school. The kidnappers, who were demanding Rs 40 lakh for the boy’s release, were traced to an unused house no 1456 in the same sector where the boy was kept hidden in a blindfold, he said. The house in built partly, with a small room, a kitchen and a bathroom, and has tall grass growing around it. Ironically, it is hardly 100 yards away from the child’s house, added Mr Qureshi. After kidnapping the boy, the criminals telephoned his parents and demanded Rs 40 lach for his release. The police was informed about the kidnapping, but requested to keep mum as a child’s life was at stake. Various police teams were formed in plain clothes to try find out the whereabouts of the criminals. The police traced the ransom calls to a PCO booth at Sheetla Mata Road and another one at Samalkha, Delhi. The police checked out these locations, in vain. Afterwards, the criminals started calling the parents using a mobile phone. The police then sought help of the mobile company to trace the phone’s location. When the location got revealed, a police team in plain clothes raided the house last night, only to see the two accused barging out of the back door and speeding away on a motorcycle, registration no. HR 26 H 1948, parked nearby. The police party started chasing them and caught up with them near Sector 55-56 crossing. Finding themselves surrounded by the police parties, the criminals started firing at the police and tried to run away. Two bullets hit a police Sumo vehicle and pierced its windowpane. The police then fired back at them. Both criminals were injured and taken to the Civil Hospital where they were declared brought dead, added Mr Qureshi. Although the child was safely restored to his overjoyed parents, the police is still puzzled about why the kidnappers chose this particular child for ransom since his father, Ashok Kumar Arya does not have the resources to arrange such a huge ransom amount easily. He lives in a rented house and run a shop at Sadar Bazar, Gurgaon. According to the SSP, they have so far also been unable to identify the two men since no identification papers of any kind were found on them. The registration certificate (RC) of the motorcycle was also not found from the vehicle. The mobile phone from which the criminals make calls also does not belong to them. The police also recovered another mobile phone from their possession, with which they presumably communicated with each other. Both the criminals were in the age group of 20 to 25. The SSP commended Deputy Superintendent of Police Kulwinder Singh, Crime Investigation Agency (CIA) Inspector Mahavir Singh, Sub Inspector Naresh Kumar and SHO of Sadar Police Station Inspector Birender Singh for playing a key role in solving the case and saving the child. Shubham Arya was kidnapped on August 4 from Sector 15 in Gurgaon and a special police team tracked the abductors mainly through the ransom calls they made through telephone, a police spokesman said. As the police broke open the door, two youth ran out of the house through the back door and fled on a motorcycle. They opened fire at police near Ghata Hill, to which they retaliated. Both of them were injured in the exchange of fire and rushed to the Civil Hospital, Gurgaon, where they were declared brought dead, the spokesman said. The police recovered a country-made pistol, a revolver and live catridges from their possession. A case under various sections of Indian Penal Code and section of the Arms Act has been registered at the DLF Police Station. 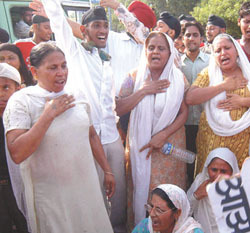 Hundred of Sikhs, including victims of the 1984 anti-Sikh riots, took to the streets here to demand action against those named in the Nanavati Commission report that was tabled in Parliament today. Remembering one of the worst riots in the post-independent India, they raised slogans and burnt effigies of Congress leaders named by former judge G.T. Nanavati in his report. The violence erupted after then prime minister Mrs Indira Gandhi was assassinated by two of her Sikh bodyguards on October 31, 1984. About 2,700 people were killed and 2,800 others injured in the carnage that leaders of the Congress were accused of engineering. “We need action against those involved in the riots,” said Atma Singh Lobana, pradhan (chief) of the Tilak Vihar resettlement colony for Sikhs in west Delhi. The widows of the victims are among the worst sufferers, as their trauma is yet to heal. “They killed my husband in front of me. How can I sustain a family of seven?” said Harbai, 57, tears rolling down her cheeks. “I have four daughters, who will help me to get them married? My children are unemployed and I am left to wash plates to keep my family going,” she said. While hearing the matter related to the sting operation by ‘Aaj Tak’ in Tihar Jail, Both the Judges said they would like to see the improvements made in the matter by the jail administration. The court also gave permission to the Delhi Government to refer the matter to the Anti-Corruption Branch (ACB) for further investigation in the case. While informing the court that the 7 officials of Tihar Jail, who were allegedly caught accepting bribe on camera, had been suspended, the authorities had sought the permission of the court to give the copy of the tape to the ACB for further investigation. The bench had asked the DG (Prisons) to explain the improvements, controls- systematic or procedural - proposed to be introduced in the functioning and administration of Tihar Jail to prevent the recurrence of such incidents. The DG had later claimed that the sting operation was conducted in a “controlled area” where public had access. Seven senior officials of Tihar Jail were suspended and criminal cases lodged against them on charges of corruption after the channel telecast a sting operation showing how information about prisoners could be obtained in return for illegal gratification. Those suspended were Senior Medical Officer A K Bachawat, Deputy Superintendents R D Bohed and Ashwini Kumari, Assistant Deputy Superintendents Vinod Kashyap, Daya Ram and Raj Kumar Criminal cases under the Prevention of Corruption Act have also been registered against all the seven officials at Hari Nagar police station here. The video clippings shot by ‘Aaj Tak’ showed how Tihar Jail officials gave out information about prisoners in return for money being paid by undercover reporters of the channel. Departmental action had also been initiated against the seven. Delhi Pradesh Congress Committee chief Ram Babu Sharma today indicated that the power tariff hike in the Capital may be reconsidered and a reduction may be in the offing. “‘Having received representations from various quarters, I have met Chief Minister Sheila Dikshit a number of times to bring to her notice public resentment against power tariff and metering woes,” he told reporters. The Chief Minister had indicated to him that there could be a downward revision or rollback of power tariff if there was no hindrance from any clause in the contract with private electricity distribution companies in city, he said. He had also communicated to Mrs Dikshit that complaints regarding meter malfunctioning should be attended to by a government agency and not by some private one, he added. Mr Sharma clarified that he had no feud with the Chief Minister. Meanwhile, asked about the much-pending notification regarding regularisation of industries in areas with over 70 per cent concentration of industrial units, Sharma said certain aspects of the government’s proposal were not clear. “Some aspects, such as payment of development charges, are not clear,” he said. The DPCC chief also announced a host of functions to mark the anniversary of Quit India Day starting tomorrow. Reacting to the release of the Nanavati Report, he defended the party and its leaders, saying no Congress leader was involved in the 1984 anti-Sikh riots even though the party had repeatedly apologised for the incidents. Special Judge Pratibha Rani sent Pankaj and Lalit Hooda, who had surrendered before the court on July 29, to judicial custody till August 22 as the CBI told the court that “they were no longer required for interrogation”. The agency claimed before the court that they had disclosed details about their accomplices and details of how they secured the question booklets and the number of students who received their SMS. The CBI had on August 5 claimed that some candidates whom they questioned revealed names of three persons — Pankaj’s brother Praveen Dahiya, Surinder Gehlot, Sanjeev — and sustained interrogation of Pankaj and Hooda was needed to arrest them. CBI says the accused, booked under section 120 B (criminal conspiracy), 420 (cheating) of IPC and Prevention of Corruption Act, helped 21 students to indulge in malpractices during the Common Entrance Examinations for admission to the Delhi College of Engineering in May this year by sending them answers through SMS in lieu of Rs four lakh per candidate. CBI, on a complaint from the Registrar of Delhi University, conducted probe and had on July 19 registered cases against the 21 students and some unknown officials of the university in connection with the case. This is what the Commissioner, MCF, Mr Mehtab Singh Sehrawat, told ‘The Tribune’ today in a formal interview regarding Faridabad’s development. Mr Sehrawat said that work on filling up potholes on heavily-damaged roads and repairs of the non-functional street lights had already been started. He said all the street light points would be illuminated with erection of many more street light poles in the coming days, so as to ensure that there was no dark spot left in the residential or commercial areas. The city has over 17,000 streetlight points at present. Admitting that nearly all the roads in the city had been badly damaged, he said filling up of the craters and potholes had been started and claimed that carpeting and relaying of these roads would start as soon as the rains were over. Stating that a project to revive the upkeep of parks and beautification of various spots in the city including some of the main roundabouts in the town had been taken up, the MCF Chief said that work on the B.K, Neelam Hardware Chowk and K.C Cinema Chowk had been going on. Though he did not reveal the total amount of funds to be spent on the various projects, he admitted that the civic body badly needed some sources of income generation. He said the available funds would be put to maximum use of creating better civic infrastructure and maintenance of the amenities. Regarding the complaints of ‘corruption’ and ‘inefficiency’ in the MCF, Mr Sehrawat said that a proper system of functioning would be put in place and no one would be allowed to indulge in corrupt practices. He said any resident who was harassed or victimised for no fault, could contact him any time. He said that the officials concerned had been directed to collect and get water samples tested at various intervals and ensure that there was no complaint of contaminated water supply in the city. He announced strict action against all those officials and employees who don’t perform their job seriously and sincerely. He said the election of the Mayor of the MCF was likely to be held soon and claimed that efforts to improve the civic conditions would then gain momentum. In this case also, certain senior officials are involved, which include a former OSD of the state government who has been waiting clearance from the authorities concerned for his hassle free retirement due next year. According to sources in the department, this official, holding a rank of a Superintending Engineer, but on deputation at present, has been awaiting a no-objection certification for his pension case, as his retirement was due on September 30, 2006. In a letter number 821/2-E/ Vig-5, dated June 28 this year, the office of the Superintending Engineer, Vigilance Circle Rohtak, has written to the Engineer- In-Chief, Irrigation Department, at Chandigarh, that the explanation of the said official, who had been posted at Rohtak, about a decade back, was still awaited. It is alleged that embezzlement of lakhs of Rupees had been made in the office at that time. It is interesting to note that the said official had written a letter to the office of the Engineer-In-Chief, some time back that the matter against him may be reconsidered in consultation with the records maintained in the YWS circle, Rohtak and the complaint may be filed. It is stated that the official had been posted as Executive Engineer at Rohtak when selection to the several posts of Patwaris had been made about ten years ago. Though the matter was handed over to the Vigilance department, it is stated that no progress could be made in the case despite the charges against two senior officials of the Irrigation department, including this officer, who after some time was appointed as OSD at Chandigarh. The matter of enquiry which had been pending for the past many years rose up in the past few months after the correspondence took place between the office of the of the Chief Engineer and the Vigilance officials. The matter has assumed significance in view of the High Court’s decision which quashed the selections made in 1994 and 1999. The official who has been faced with a probe into the case is likely to retire in September next year. It is learnt that he had been interested in adjusting in the organisation where he had been serving at present on deputation, where he could enjoy an extension of two years of service after retirement. According to sources, despite the fact that he enjoyed closeness to a former Chief Minister, the opening of the Patwari’s selection case could bring down all his aspirations and the move made to get a clean chit in the case before the retirement. The police claimed to have recovered two loaded carbines, a pistol, a bulletproof jacket, Rs 1 lakh in cash and a Toyota Qualis vehicle from their possession. The accused persons who were arrested have been identified as Neeraj Sharma, Neeraj Yadav, both UP police constables, Mehrajuddin, Nafis alias Peeru, Yunus Khan, Sudhir Kumar and Anuj Kumar alias Azad, all residents of Muzaffar Nagar. Acting on a tip-off that some persons belonging to an inter-state gang would assemble on August 7 near Sanjay Jheel in Kalyanpuri area to commit dacoity, the police laid a trap and nabbed them. During interrogation, the accused persons disclosed that they had come to commit dacoity in a petrol pump in Kalyanpuri area. For this purpose, they had arranged two carbines from Neeraj Sharma and Neeraj Yadav, PSOs to the MP from Muzaffar Nagar. Both Neeraj Sharma and Neeraj Yadav told the police that they had provided their carbines to earn some easy money. On the other hand, Mehrajuddin wanted to earn a quick buck as he was planning to contest elections from Pardhan village. In another case, the Central district police today claimed to have arrested four persons for their involvement in more than 100 cases of dacoity, attempt to murder, burglary and theft. The police recovered one country made weapon along with three live cartridges, four stolen vehicles and jewellery worth Rs 1 lakh from them. Acting on a tip-off that some persons were planning to commit dacoity in a house in Hauz Qazi area, the police laid a trap and nabbed them. While the four persons have been identified as Akhlaq Ahmed alias Salim, Mohammad Washi alias Nadim, Mohammad Hasan alias Rajan and Mohammad Arshad, their associate who managed to escape during the incident has been identified as one Sharafat, resident of Mustafabad. During interrogation, the accused persons confessed to their involvement in at least 13 cases of burlgary. The Noida Authority had, in the latest draw, reportedly allotted a plot in reserved category for farmers to a person who had died 11 years ago. While this was the machination of a property dealer, the two sons of the dead man are feeling deprived of a large booty. Son of a farmer Rattan Singh, from Barola village has filed a report in Sector-20 police station, Noida. The land of a farmer, Rattan Singh was acquired by Noida Authority in 1976 and the land compensation had duly been paid to him. A residential plot was to be allotted to him under village quota. But Rattan Singh had died on October 5, 1994. This right had thus passed over to Rattan Singh’s four sons. 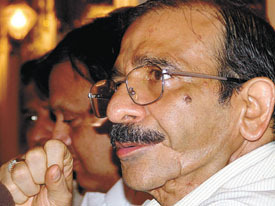 Rattan Singh’s two sons were keen to get a residential plot. But as the claimants were more, both the sons could not succeed. The plot in question was surprisingly allotted in the name of Rattan Singh who had died 11 years ago. On making enquiries his sons came to know that a property dealer, Neeraj Chauhan of G-2, Central Park, Sector-62, Noida was the culprit. Chauhan had opened a fictitious account in a private bank in the name of Rattan Singh and a bank draft no 3383 on his behalf was deposited with the application form. Now Rattan Singh’s sons, Mahinder Singh and Satender Singh have filed a report in Sector-20 police station against a property dealer of the village who is suspected to have a played a key role in filing a fictitious application on behalf of late Rattan Singh to make a quick buck and to deprive his sons of their legitimate right. The incident occurred in full view of hundreds of litigants, lawyers and court employees but no one reacted, enabling the accused to make good his escape. Acco0rding to the police, the incident occurred after the trial for the day of the 28-year-old accused was over and he was being taken back to the lock up by policemen. Arrested in a case of theft from Paschim Vihar, Rajiv was being tried under Sections 389 and 411 at the Tis Hazari courts. “The routine procedure of suspending the police personnel escorting him is being put into place and an inquiry into the incident ordered,” the official added. Meanwhile, efforts are being made to trace the suspect and his accomplice. His description has been flashed to all the police stations and some of his known haunts were being raided, the police said. The success rate during last campaign was 30 per cent on the first day. According to District Coordination Officer, Dr. PK Dublish, only 1.10 lakh kids could be immunised during the first day of last year’s campaign. This year’s campaign was formally launched by the CMO Dr Vinod Kumar from a booth in Sector-30 government hospital here. For the next few days, some 603 teams will be going door to door to administer pulse polio drops to all children under 5 years of age. In all, 836 booths have been set up in the district. About 44 booths have been set up at railway stations, bus stands and tempo stands etc this year to cater the population in transit. Besides the administrative officials, 194 supervisors have been deployed by health department for the campaign. In Khora colony, 16,500 kids were given the polio drops. Some 96 polio booths have been set up there and up to two teams were deployed in each booth, Dr. Devinder said. Last time only 9500 kids had been administrated pulse polio drops there, Dr Dublish said. The accused persons were identified as Sanjay Gupta (31), a resident of Shalimar Bagh, Sunil Kumar Mehta (43), a resident of Mayur Vihar and Gautam Verma (20), a resident of Rohini. Acting on a tip-off that some persons were involved in a cricket-betting racket on matches being played between India-West Indies at Colombo and Australia-England at Edgbaston, England, the sleuths raided the premises and nabbed the accused persons. The sleuths said that at the time of nabbing the accused persons, they had already received satta worth Rs 5 lakh. This is for the first time Director General, AFMS, has initiated the practice of participatory management in the AFMS. It was pointed out that the deliberations would help in sensitising the environment towards the challenges that lie ahead in the path of the career of AFMS Officers and help make the systems and process in the AFMS more efficient. The brain storming session is being organised with a view to ensure that all practical ideas are taken as input as a part of participatory management techniques to improve services. The AFMS Cadre covers medical officers of varying ranks in the Army, Navy and Air Forces functioning in diverse spheres as Specialists, Medical Administrators and non-medical logistic officers. The Delhi Cabinet today gave its approval to the proposal to increase the rates of land acquisition in the capital by 12 to 13 per cent. Briefing reporters, Delhi Urban Development Minister Dr A K Walia said that the rate for acquisition of agricultural land has been hiked from Rs 22.83 lakh per acre to Rs 24.94 lakh per acre. This is an increase of 12 per cent. As for riverbed land alongside the Yamuna, the Cabinet decided that the rate for acquisition should be increased from Rs 7,16,000 per acre to Rs 8,09,000 per acre, an increase of 13 per cent. The last time the land acquisition rates were increased in the city was in 2001. The new rates will be applicable from today, Dr Walia said, adding that the step had been taken in view of the decrease in the bank interest rates as suggested by the Urban Development Department. He also said that the Department had only recommended a hike of 8 to 10 per cent. A woman was crushed to death today while she was working in a factory at Mohkapur in Meerut district, police said. Maya (40) was killed when she accidentally came in contact with a running machinery at Barkha factory. Police rushed to the scene and a case was registered.